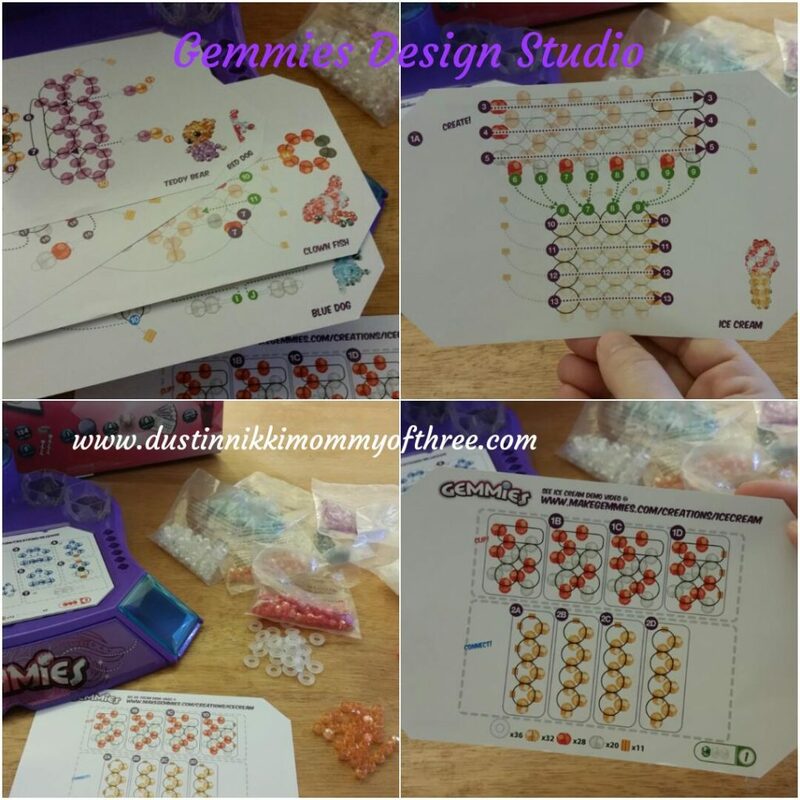 Recently I received a free Gemmies Design Studio for our use and review. I was not compensated for this post. All opinions expressed in my review are 100% my own honest opinions. 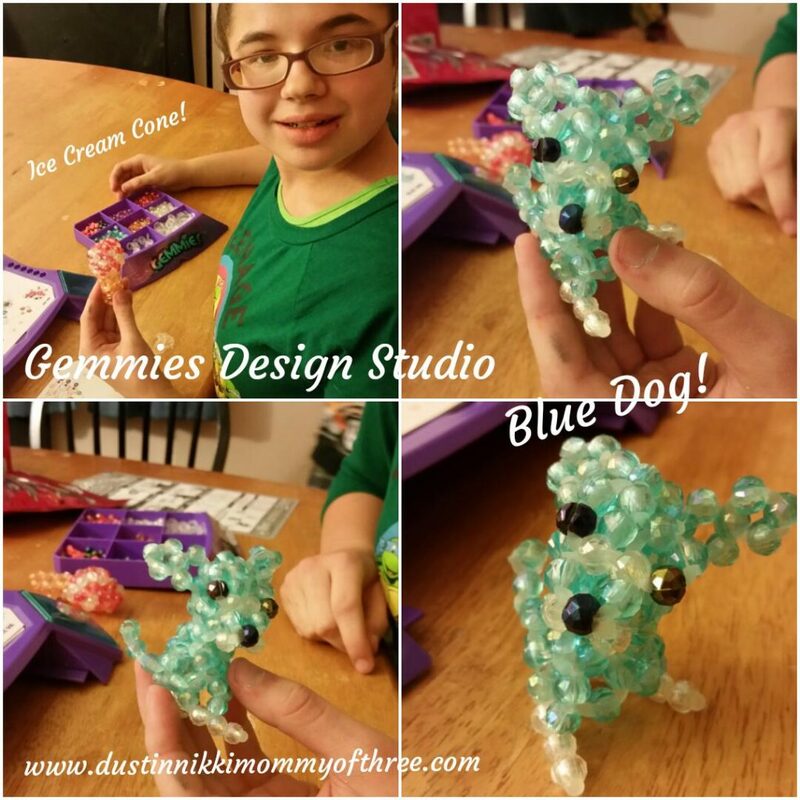 My daughter loves Gemmies and the little animals you can make with them are so adorable! Included in the box is the design studio itself. It has a drawer for storage of everything that is included. There are enough beads and rings to make 5 creations. 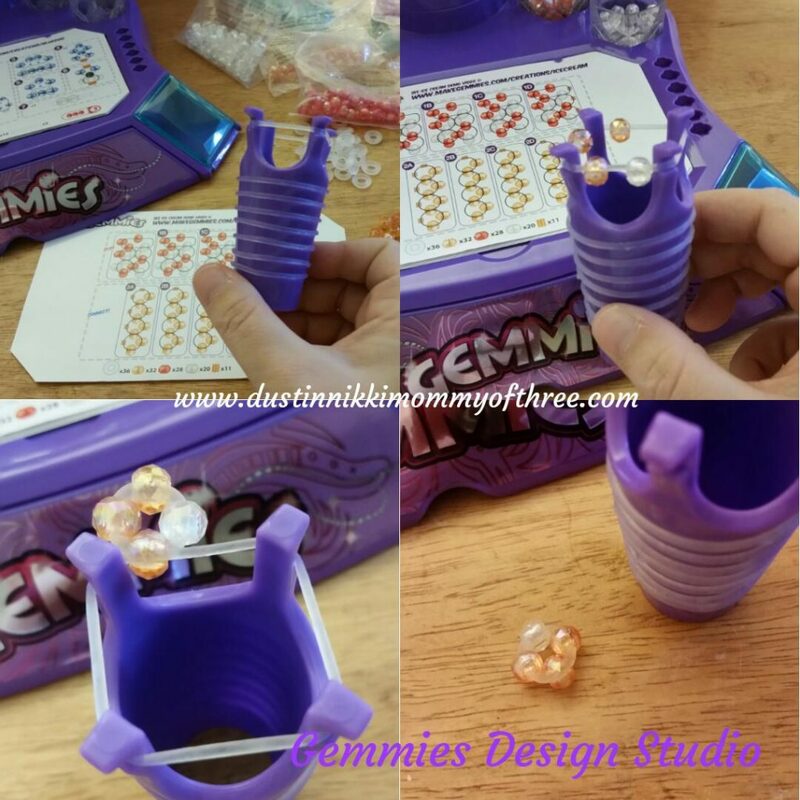 There is also a gem tool which can be used to easily clip/snap on beads to each ring. The gem tool can be used by fitting the elastic rings on the bottom of it and sliding it up to the top where it stays in place and holds the ring taught so you can easily clip on the gems. The gem beads have a small slit on the side of them and they are snapped onto the ring via the slit. It’s as easy as putting the side of the bead against the ring and pushing so that the bead is clipped onto the ring. You can also load up the gem tool with multiple rings sliding the next one into place after taking the top one off when you complete the ring. That way you don’t have to put another one on each time you complete a ring. It’s actually pretty easy to do and this makes it easier for younger kids to put the gems on. The design studio comes with 5 creation guides. You can make a clown fish, ice cream cone, blue dog, red dog, and a teddy bear. At the bottom of each creation card it lists the number of each parts you need and shows you the difficulty level. What my daughter likes to do is to count out all the beads and parts she needs for the particular creation she is working on and place all the pieces in the clear cups that are on the design studio. That way she doesn’t have all the other beads out and with the ones she needs are separated, she can work a lot easier. Once all the parts are counted out all you have to do is follow the pattern on the creation card. If you need help, they made it easy by putting a website address to take you to a video of that particular creation. At first the pattern instructions were a little confusing but after a few minutes my daughter had it figured out. 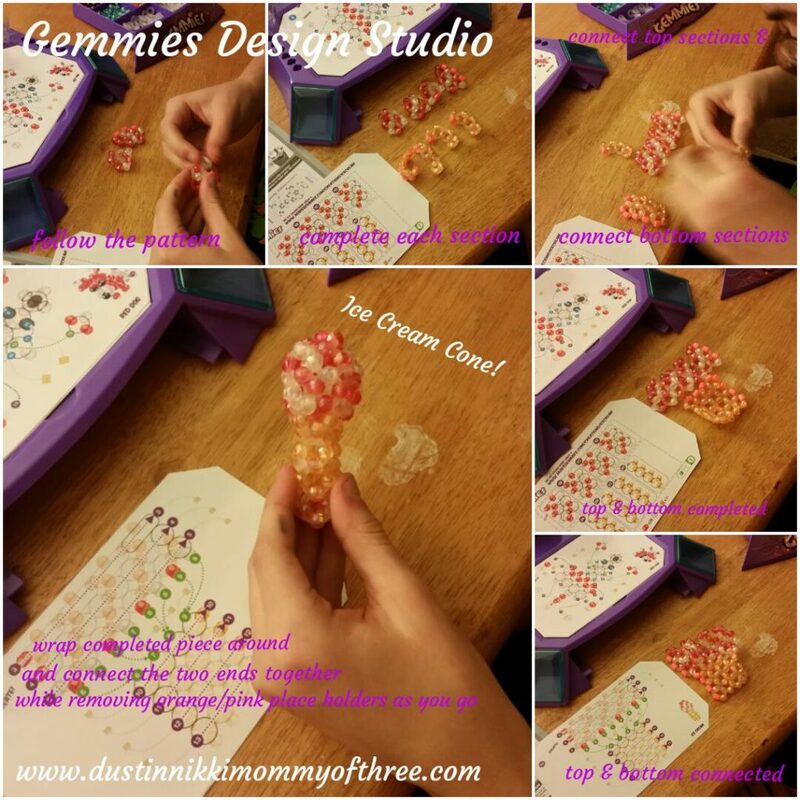 She also found out that for her, it was just easier to stretch the rings and hold them with her fingers while adding the beads instead of using the gem tool. She found she could work faster and easier that way. The design cards have sectioned squares on it. You follow the pattern for each section so you will end up with multiple completed pieces. Then you connect all those pieces. Most of them have a top row of sections and a bottom row of sections. 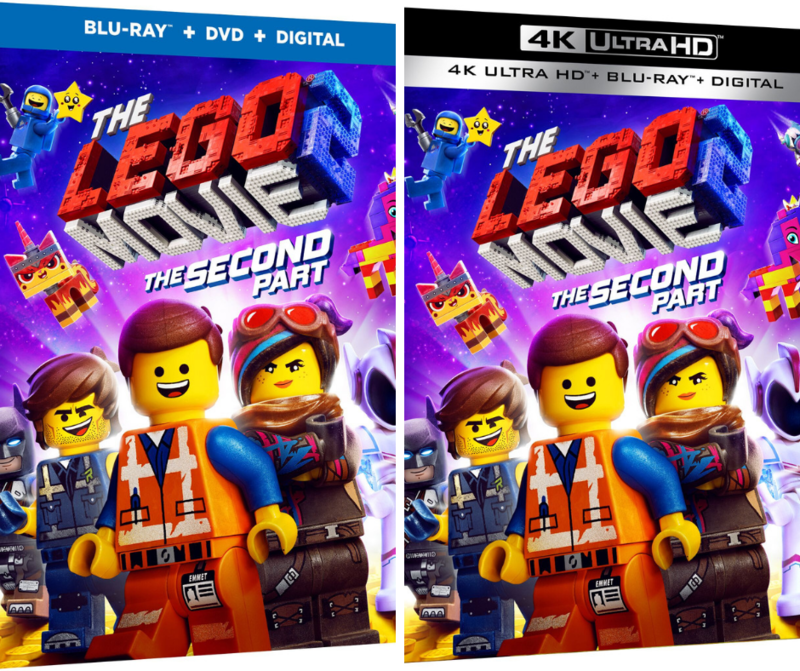 After both rows of sections are connected, you are left with two completed sections. Then you connect those pieces together. Once you have one piece, then you wrap it around and connect it all together. I hope my explanation makes sense. It’s hard to explain in words but the creation cards make it pretty easy once you get the hang of following the pattern. Following the pattern was confusing at first because it shows what color beads are on each ring and all the rings are together on the pattern. For example, say the first ring had a red bead at the top, red bead on the right side and a white bead on the bottom. The ring below it has a white bead on top. We kept messing up because we would have all the beads on the top ring right including the white bead on the bottom. The ring below it we still put a white ring on top but we didn’t actually need that white bead on top because the white bead on the top ring connected to the ring under it. I kept messing it up but my daughter flew through it like it was nothing. So to sum it all up, it looks more complicated than it really is. Unless of course, you are me. She spent about 3 hours and made the ice cream cone (which is a level 1) and the blue dog (which is a level 5) in that time. I just love that little blue dog. It’s so cute! Now you do need to take care with the beads because if you drop one or lose one somewhere, there aren’t very many extras included. The rings are like a really think rubber band and they are very durable. We didn’t have a worry about them breaking while stretching them to put the gems on. The studio also comes with a light display too which makes the creations look really neat when they are sitting on it. The age recommendations are for 6 years and older which I highly agree with. 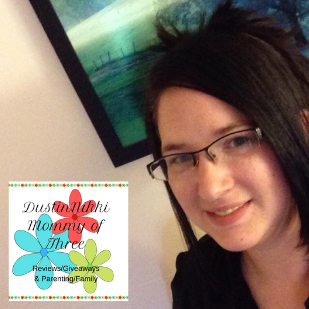 Like I mentioned before, it is a little confusing at first so younger kids may need help. Which I am okay with because it’s fun to create things with your kids. 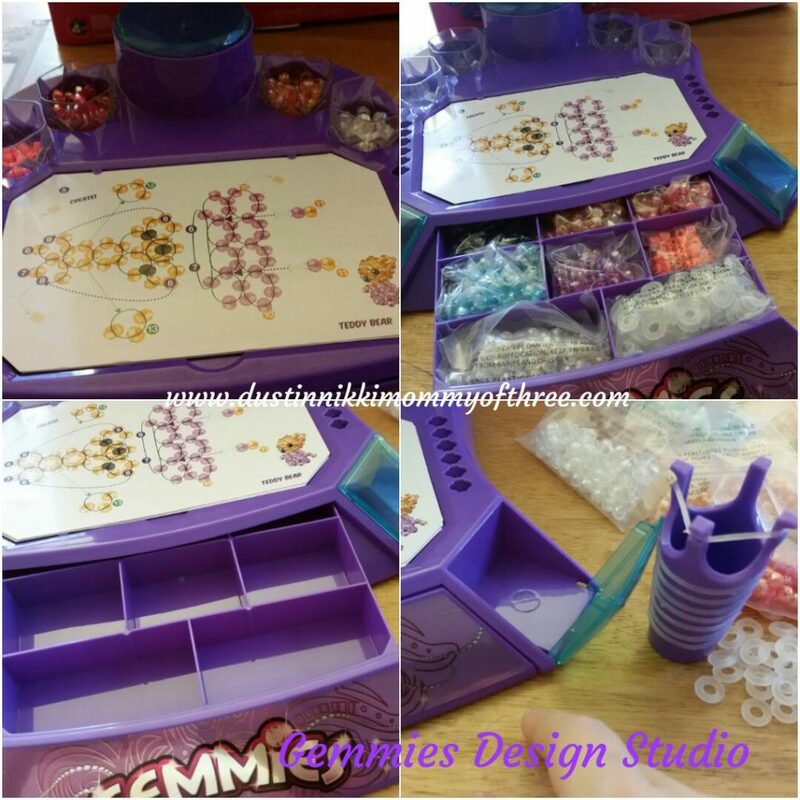 Gemmies have quickly become one of my daughter’s favorite things to create with so more refill/activity packs have been added to her Christmas list! We love it! 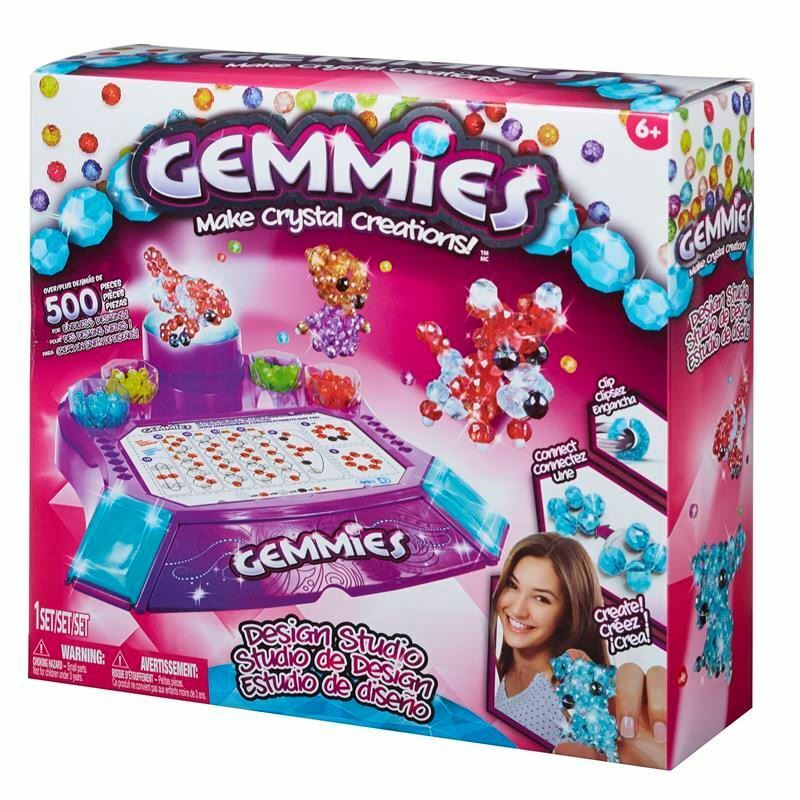 Buy It: You can buy Gemmies online by using the link above. You can now buy them at Target stores. Target carries the design studio for roughly $22. Also look for their smaller activity packs to go with it! 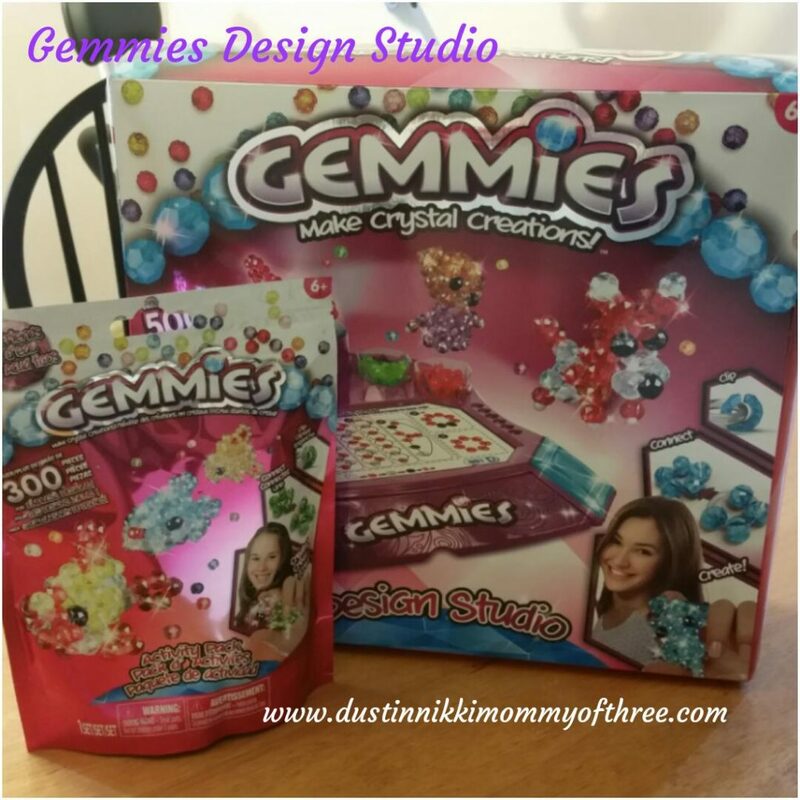 Stay tuned because within a few days, DustinNikki Mommy of Three will be giving away a Gemmies Design Studio and Gemmies activity pack! 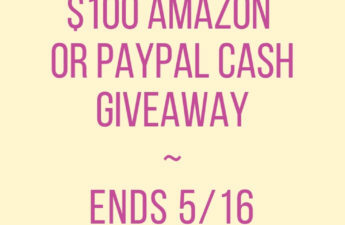 Keep an eye out for our blog giveaway post coming very soon! Disclaimer: I received product mentioned in my review free for my use and review. All opinions expressed in my review are 100% my own. My girls would love making that ice cream cone and bracelets! 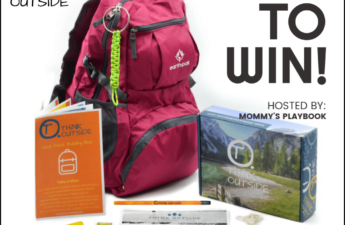 My daughter would completely flip for this. She is all about blinging anything and everything she can. This would keep her busy for hours. My daughter would LOVE making her own creations but I know she’d be all about that cute lil blue puppy! my kids would be super interested in making the animals in this kit! i love that theylight uyp too! My granddaughter would have fun making bracelets and little animals.